Diesel Fuel for Life Denim Collection for Him is bright and fresh flavor. Diesel Fuel for Life Denim Collection for Him 75ml. Eau De Toilette - New Perfume Diesel Fuel for Life Homme Denim appeared in 2011 will remind tradition Diesel, which is a very well known brand. 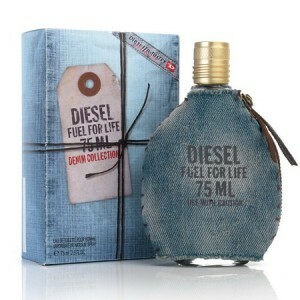 Diesel Fuel for Life Denim Homme is a fragrance with a fruity-floral fragrance for men with fine wood accents. Fresh and juicy fruit will leads you to the garden where you can relax in the shade of the trees and you can enjoy the scenery. Aroma highly appreciated among young people who are subject to the requirements of fashion. At first you can smell the citrus, which refreshes both body and mind. Then continue with juicy raspberry and lavender tones very subtle. Finally, you can feel endless agreements warm wood that surrounds the mystery body and pamper your senses with an additional maximum durability. diesel fashion house very famous worldwide for the two original products owned. The first is undoubtedly youthful and attractive clothing, dominated by the blue denim. The following products are brand Diesel fragrance that perfectly complements the outfit. Both products have a lot in common. More style, innovative, luxurious and quality. This vigorous tree "elixir of youth" by Diesel - modern flavor, which at the same time can be called a classic. In Denim Collection legendary denim brand creates a true olfactory communication with our time. Freedom, youth, vitality, hedonism and adventure - the values, according to Diesel, who embodies the fragrance Fuel For Life Denim. TOP NOTES: lemon, lime, star anise. Heart notes of lavender, raspberry, rosemary. MIDDLE NOTES: dry wood, powdery chord.